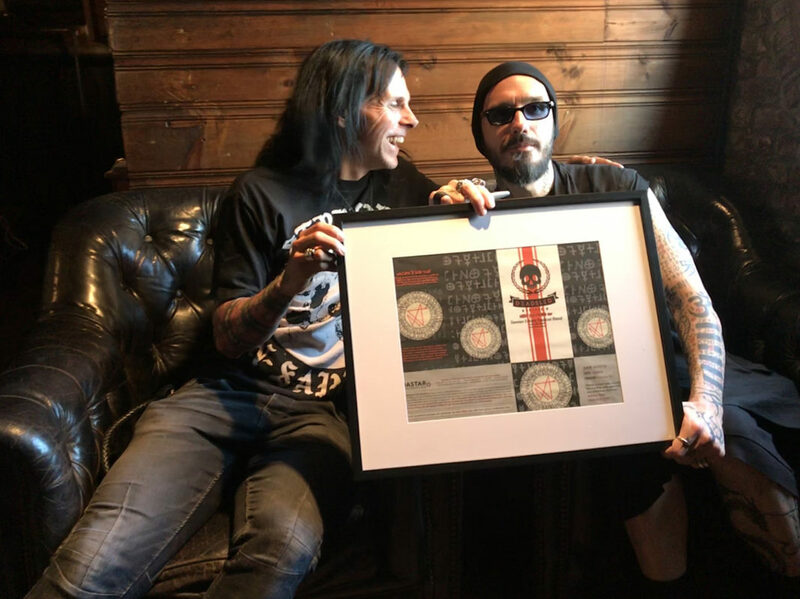 Damien Echols Artist Blend and What IS the Artist Blend? 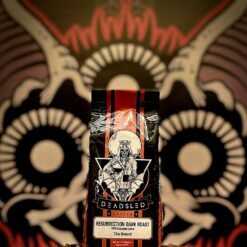 When we started Dead Sled Coffee®, our first commitment was obviously great coffee! Our second commitment was community. Creating a brand that would appeal to outsiders and, hopefully bring people on the fringe together. For centuries, nothing has brought people together like coffee. Especially the black sheep. 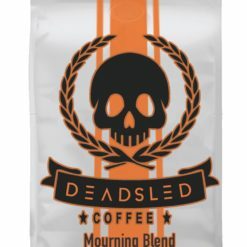 Here at Dead Sled we are card carrying members of that group, and love and embrace our fellow non-traditional family members. We decided that the best way to do this would be to invite various artists to participate in tasting and formulating their own proprietary blend of coffee. 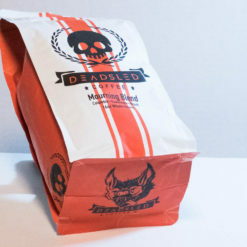 Also, to participate in designing the artwork on the packaging for their coffee. It’s our goal to shine the spotlight on the lesser known talents of some of your favorite artists and we are going to do that through coffee! We humbly introduce our first artist: Mr. Damien Echols. Damien’s name might ring a bell. 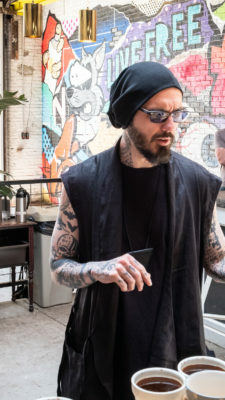 When Damien Echols was 18, he and two other young men were wrongfully committed of murder, eventually becoming known as The West Memphis Three. Having received a death sentence, Damien spent almost two decades on death row, until he was released in 2011. What you may not know, is that since Damien’s justified release, he’s been a creative juggernaut and that’s what brought us together. In January 2013, Damien held his first gallery exhibition, ‘Moving Forward; Looking Back,’ at Sacred Gallery in NYC. Since then, I’ve followed his artistic development, and have gotten to know Damien pretty well and consider him a good friend. I mentioned our community before. Part of being in a community means feeling a sense of togetherness. A family. When we’re together, we feel safe. When we feel safe, we can be ourselves and be free. Damien absolutely embodies this concept in his life and through his art, so it was a no brainer to ask him to create our very first artist blend. This October, Damien will release his third book, High Magick: A Guide to the Spiritual Practices That Saved My Life On Death Row, (he’s also written a New York Times best-selling memoir, Life After Death and released Yours to Eternity with his wife Lorri Davis). What is High Magick? Most people either think of magic as stage illusions or an occult practice involving dark rituals. “Magick is an incredibly deep, meaningful, spiritual tradition that equals the Eastern practices of Buddhism and Taoism in beauty,” says Echols. “It’s an ancient discipline that lets you literally change reality by working with the divine energies of creation.” In his book, this extraordinary teacher shares key meditations, insights, and step-by-step instruction to awaken the power of magick in your own life. Damien Echols Tzadkiel Blend is a pairing of coffees that together evoke a magic best enjoyed with creative friends, outcast neighbors, or while reading any of Damien’s books. The coffee comes from the Sito Marmeleiro farm in Brazil and the Finca Nuevo Amanecer coffee from Guatemala. Damien’s blend is named after Tzadkiel, the archangel of freedom, benevolence and mercy. He also designed the talisman on this packaging. 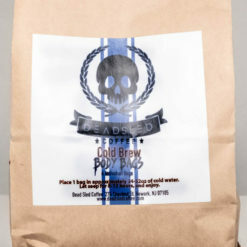 This coffee is available only in whole beans, and it is roasted fresh once a week only. 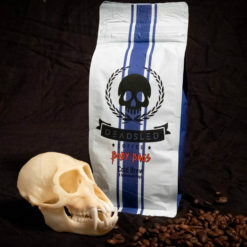 This entry was posted in Dead Sled Coffee Blog and tagged Artist Blend, Damien Echols, Damien Echols Artist Blend, HIgh Magick, Tzadkiel Blend, West Memphis 3.